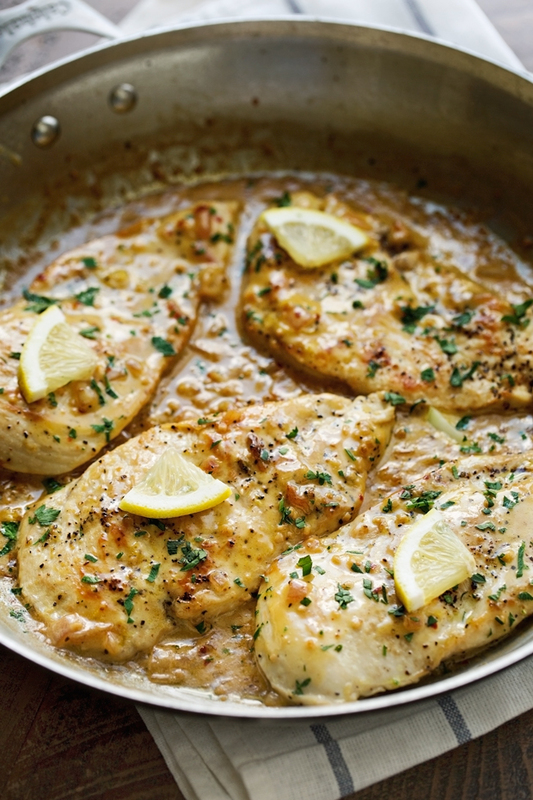 Hello, hello to my new favorite creamy, garlicky, lemony, delicious skillet chicken! You guys, I’ve gone completely head over heels for today’s meal (I didn’t mean for that to rhyme. As many of you have probably guessed, I have a love for white meat chicken. It’s no dark meat for me. But the good news is that today’s chicken dinner is customizable to your chicken needs. 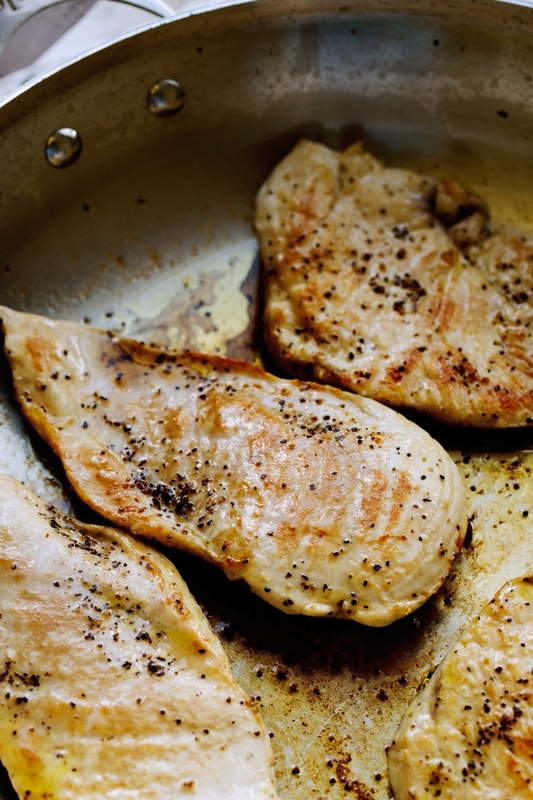 Boneless skinless chicken thighs, sure, why not! *Applause* you’ve only just waited half of FOREVER for me to bring you something that could be made with something other than boneless skinless chicken breast. 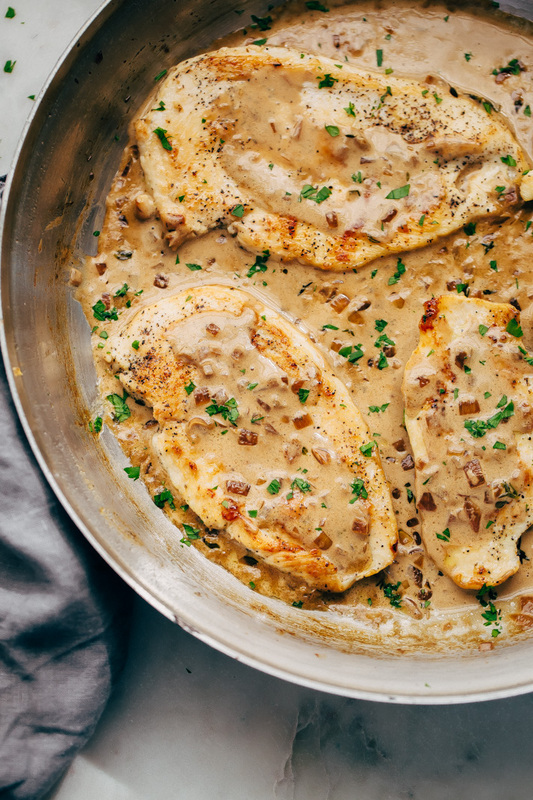 This one skillet chicken recipe is my go to chicken dinner of the week decade. Obvi, this recipe requires just one pan. Which means, we make the chicken and the sauce – that’s right – in just uno skillet-o. 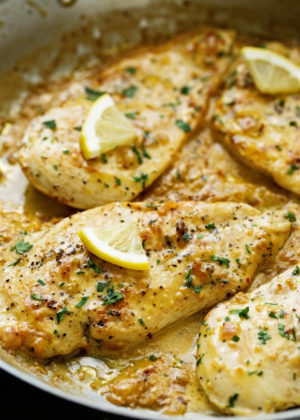 We’re talking tender chicken, covered in a lemon garlic butter sauce that’s creamier that anything you’ve had before. Someone, please, throw some capers up in the sauce! This only *just* hit me now, but I’m totally doing it next time, pinky promise. Should I just stop here? Are you on your way to the kitchen, cuz ya should be! This recipe is somewhat, kinda sorta adapted and inspired by my Garlic Butter Salmon in Foil . We’re using a lot of the same ingredients like butter, lemon juice, garlic, red pepper flakes, and parsley. What takes this chicken dinner to the next level is chicken broth and a big splash of heavy cream. The sauce has a nice creamy consistency that would taste AMAZING tossed in some angel hair pasta. The pasta-bilities are ENDLESS. See what I did there. 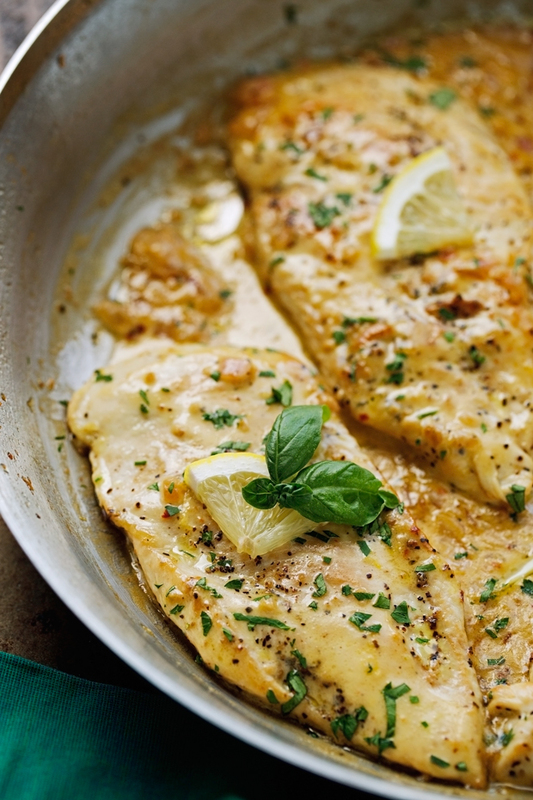 Get those chicken breasts cooking on both sides. You don’t have to worry about cooking the chicken all the way through. We’re just looking to get some color on the chicken and for all those wonderful flavor bits to form in the bottom of the pan. The ‘flavor bits’ are going to be deglazed with chicken broth and lemon juice to make the lemon garlic cream sauce for this skillet chicken. 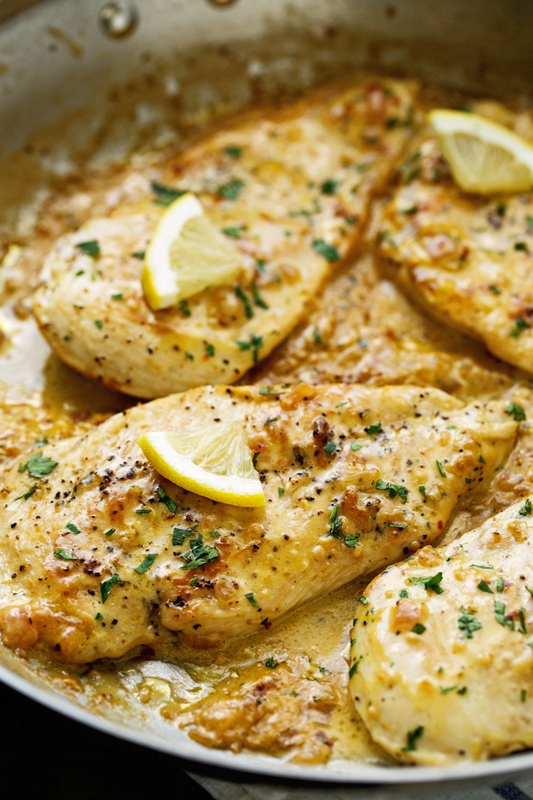 If you’re using chicken breasts or boneless skinless chicken thighs, just make sure that all of them are about the same thickness. Mine were about ½-¾ inch thick. I browned each side of the chicken for just 2 minutes. Don’t worry about cooking the chicken all the way through as we’re going to finish the sauce and the chicken together in the oven for a quick 5 minutes. To be honest with you, I was a little intimidated with the idea of adding heavy cream to a lemon sauce. I had the biggest fear of it curdling on me. I find the trick is to use just a couple tablespoons of lemon juice and to reduce it with the chicken broth. Once that’s done, I lowered the flame and melted some butter into the sauce. Finally, taking the sauce off the heat completely, I whisked in the cream and placed it back on the flame for just a couple of seconds. Don’t let the sauce come to a boil. And it worked, beautifully! And can I say something? This is the best lemon garlic cream sauce I’ve ever had! A big pat on the back. Checking the cream sauce off my culinary bucket list! Hooray! But with victory came pain! I pulled the skillet out of the oven, placed it on the store and lost in thought, a few seconds later I decided to grab the handle WITHOUT an oven mitt. UMM.. OUCH! NOT FUN! Hand burning! Feels like fire ants having a picnic in my palm! That’s definitely going to leave a mark! ? So once the pain finally subsided from my burning hand, I topped off this one skillet chicken dinner with a handful of chopped parsley and a little basil. Use whatever fresh herbs you’ve got on hand, you really can’t go wrong! I served it up pretty simple this time around. Just a little steamed broccoli and a side salad. You could always do a little rice to catch all that sauce. Pasta is always perfect with a lemon garlic cream sauce. *Please note: the nutritional facts calculated are an estimate based on the ingredients I’ve used. If you’d like a more accurate count, please calculate them using the ingredients/brands you’ve used to prepare the recipe. 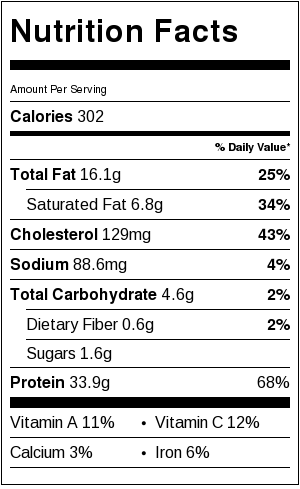 The nutritional facts provided is for ¼ of the recipe, assuming you use a total of 1 1/4lb. 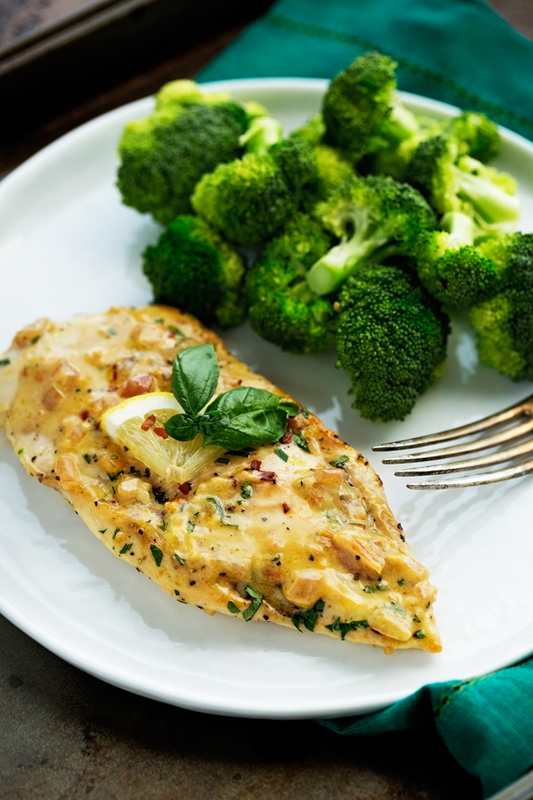 boneless, skinless chicken breasts.